We are busy tending to the winter garden and veggies are looking mighty good! 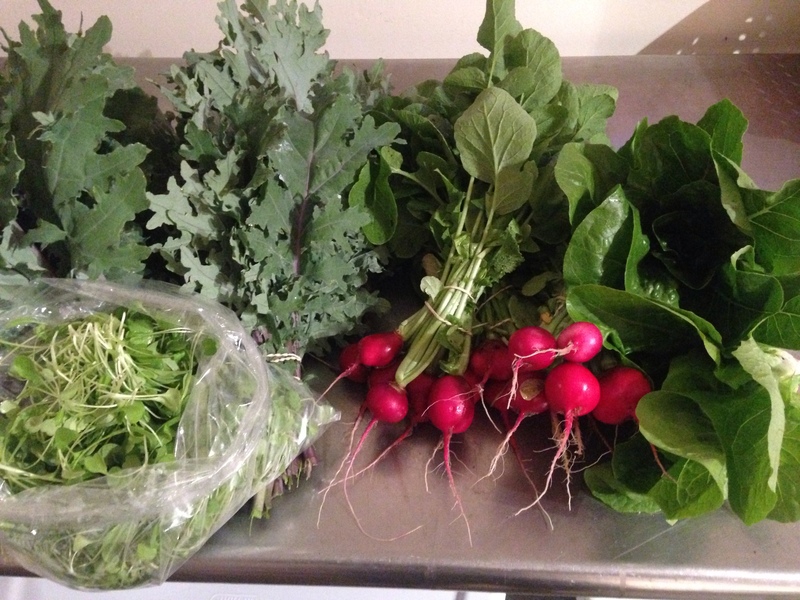 Eat like a farmer, all winter long! In the deep, dark winter months our family relishes biting into a crisp spinach salad or cracking open a jar of carrot-tomato soup. We want to share that with YOU! Using our Vermont summer harvest and season extension High Tunnels we provide a copious amount of “stored farm goods”. The Vermont tradition of storage ranges from cellaring, freezing, canning, fermenting and holding in the Hi-Tunnels. The Share period starts Tuesday October 9 and ends February 5. Shares are distributed every other week for a total of 10 deliveries. Share comes with one tasty quart of soup. The soup makes for an easy meal with a side of farm salad. We can accommodate dietary needs however, if you have severe allergies and need to opt out of the dinner, we can accommodate. Regular Shares are priced at $600 ( $60.00 for two weeks of food) and the Large Share is priced at $850 ($85 for two weeks of more food). Beef, Lamb, Chicken and/or Pork Shares are also available for add on’s. Shares can be picked up at a Kenyon’s Hardware Store in Northfield, Roger’s Farmstead in Berlin or Roxbury every other Tuesday from 3 pm to 6 pm. All food items are delivered in one box. All items will be in one box that you pick up and take with you (you will need to remember to return them each share) or you can empty the box into your own bags. A freezer bag for frozen items is placed in the box. To limit waste we pack salad greens in a glass container which keeps them fresh for long. We ask for a deposit, a separate check ($40/reg share and $60/large share) that will encourage you to return the items at the end of the share season. The deposit is returned once all boxes, bags and containers are returned. This is a great value for the money! It looks like a LOT of food and it is. BUT. We help you plan how to use it so that you systematically get through it all in two weeks without waste and it doesn’t mean huge nights in the kitchen! Fresh greens first. Save your prepared dish for a night when you really need it as it can be frozen. Work through the storage veggies as time permits as they aren’t going anywhere. You will feel good about what you are eating! Pork is two packages about 1 lb. each and they will vary each share week and will consist of ground pork, sausage, bacon, pork chops, ham steaks and more. Chicken is from Small Step Farm in Roxbury. The chickens will range from 3.5-5 pounds (they may be more)! You will receive a variety of sizes with lots of informative recipe ideas. $200. This is a great savings! Retail price is $5.25 per pound. Please don’t hesitate to ask any questions! To sign-up please fill out the form below or email or call. If you would like to pay via paypal, please contact Misse.